Two games into his tenure as San Francisco coach, Kyle Shanahan is still seeking his first win and his first touchdown for the 49ers. Safety Eric Reid of the San Francisco 49ers is checked by trainers on the field after a play against the Seattle Seahawks during the second quarter of their NFL game at CenturyLink Field in Seattle, Washington, on September 17, 2017. Now he faces a short week to try to end those droughts and will be without a key player in strong safety Eric Reid. 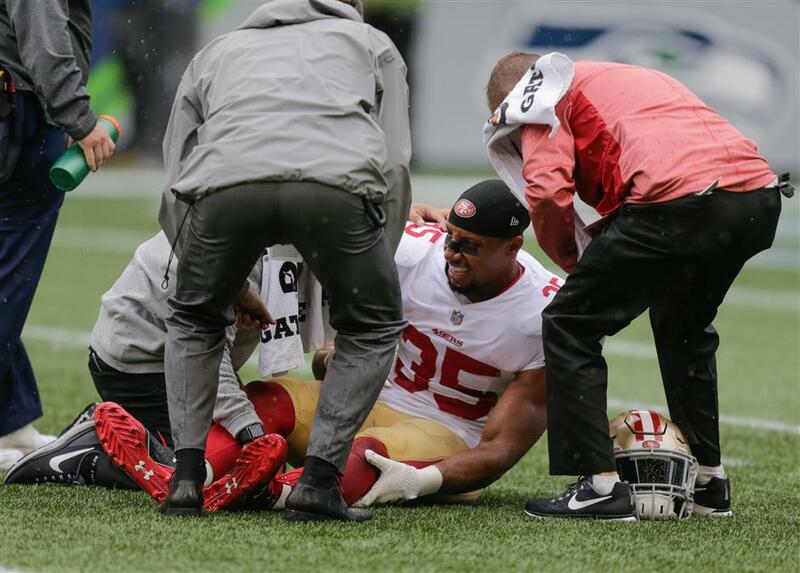 Reid injured his posterior cruciate ligament on Sunday at Seattle and will miss at least Thursday night's home game for the 49ers (0-2) against the Los Angeles Rams. "The good news is, he's not going to need surgery, so it will heal on its own," Shanahan said on Monday. "But he's definitely not going to play this week. ... It's probably going to be a little bit longer than that, also." Reid got hurt in the second quarter on a non-contact injury away from the ball on an incomplete pass. He came back for the start of the second half but then left twice after aggravating the injury. The Niners' other starting safety on Sunday also could miss Thursday night's game. Jaquiski Tartt has an injured neck and is questionable this week. That puts even more pressure on a San Francisco defense that has played well the first two weeks with little to show for it because of an inept offense. The 49ers shut down Seattle for most of the game on Sunday before losing 9-12 when Russell Wilson threw a late touchdown pass against a tiring defense that was on the field for 79 plays. Now they don't have much time to rebound with the Rams coming to town on Thursday. "They were out there definitely more than we would like without a doubt," Shanahan said. "But even if they were out there a normal amount of plays, if they were out there 60, nothing would have changed. We've got to do everything we can to get the players fresh for Thursday. ... I've played a number of Thursday games. It's always a challenge for the players because your body is never quite ready by that time." The short week also takes a toll on the coaches, who will have little time to put in new game plans for this week. Shanahan said the game plan will be finalized on Tuesday, instead of taking three days to do it. Making the process slightly easier this week is the fact that both teams run similar offenses, with Rams coach Sean McVay having worked under Shanahan when he was offensive coordinator in Washington. "They know what we do and we know what they do. So, their offense is very similar to what I've done since we worked together in Washington," Shanahan said. "So, there are some very similar things in our schemes that I think both defenses at least probably have seen a lot of in training camp. But usually these Thursday night games, don't come down to a scheme very much. It comes down to how fresh the players are, who recovers more from the Sunday before that, and who feels less sorry for themselves for how they are feeling and really goes out there and competes the hardest."